Manchester United fans turned on Michael Owen last night in their droves, despite their emotional win against PSG. In the BT Sport studio, Rio Ferdinand, Owen Hargreaves and Gary Lineker went up in celebration as Marcus Rashford’s winning penalty hit the top corner – but the former Liverpool and United striker stayed in his seat. Owen is officially an ambassador for Liverpool FC, but our fans, in the majority, haven’t forgiven him for ending up at our bitter rivals during his playing career – and subsequently winning a Premier League title with them. A few weeks back, he faced heavy criticism from United supporters for claiming if he was a Liverpool player in our Old Trafford draw against them, he’d have been kicking at an injured Rashford’s ankles, considering United had already made their subs. It was extremely honest punditry and we actually respected it. We’re not sure Owen will ever be entirely forgiven, but should it at least be a positive that he’s now nailing his colours to a mast, instead of claiming he was happy to have played for both? We imagine amongst most circles, it won’t make a difference, actually – but there’s part of us that feels sorry for him. He made stupid decisions and his habit of putting his foot in it means he’s now scoffed at instead of being regarded as a Premier League great and a Ballon d’Or winner. 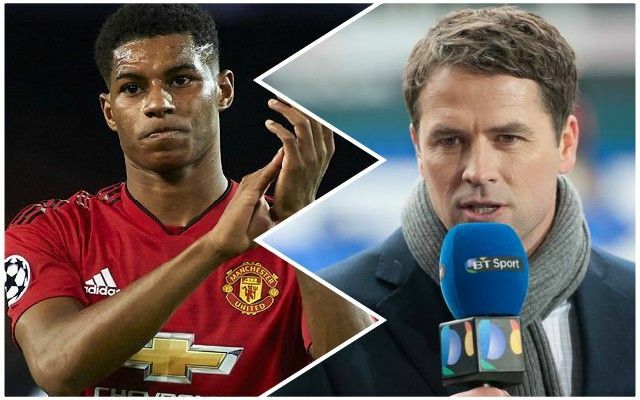 The whole of the BT Sport studio salutes Rashford's goal except desperate wannabe Liverpool fan Michael Owen. Mate, they're never going to take you back!